Yglesias suggests that Amazon.com can be an valuable enterprise not by actually becoming profitable on a cash-flow basis, but as an ever-growing stockpile of valuable capital equipment. That's what they're spending a whole lot of their money on, and it's not like that stuff disappears at the end of the year. They still have it, and its value is part of the value of their business. So can Amazon live up to its valuation ($130 billion in market cap at present) as a whole lot of capital equipment? No. Not even close. Amazon's price to book value ratio is about 15:1. In other words, their total assets minus their liabilities are one fifteenth of their stock price. If Amazon were liquidated tomorrow, shareholders would lose about 93% of their money. And if you look at the balance sheet, "Property, Plant, and Equipment" is about $7 billion -- a bit over one twentieth of what the company is worth. Amazon's cash on hand actually exceeds that. 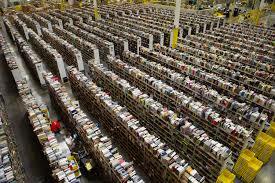 (For what it's worth, I don't know whether Amazon's warehouses and offices and such are company-owned -- my guess would've been that a lot of the property is rented, and you don't get to sell that.) So the proceeds from liquidating Amazon's capital equipment don't play any significant role in justifying the value of the company. Which is as you'd expect. Capital equipment is illiquid -- you can't buy it, use it a bit, and turn around and sell it for near the purchase price. Especially bad in Amazon's case is that it's a one-of-a-kind business. If it had, say, two competitors who were trying to grow fast and become the dominant online retail juggernaut, maybe they'd bid against each other for Amazon's stuff and drive the price up to pretty close to the price of buying stuff new. But actually zero other companies are doing that, and if Amazon couldn't make a profit and had to liquidate, that'd strike people as a bad sign for the whole idea. Maybe some other companies could retool some of Amazon's stuff to their smaller mission, but they wouldn't be inclined to pay full price. So a lot of value would just be lost. The truth is probably a little closer to Ygs' position than you're letting on here, essentially because PP&E as carried on a balance sheet does not usually do a good job of reflecting capex in the sense he's discussing. For Yglesias, reinvesting profits means spending money to create new business, one way or another, usually in ways that don't count as capital expenditures from a balance sheet perspective. One great example for Amazon is software: famously, another Seattle company you might have heard of carried an entire global monopoly operating system on its balance sheet at $0 -- the costs of development of the IP are just programmer salaries, which count as expenses. Aside from own-development usually being at far from resale prices, depreciation schedules are usually quite accelerated, because that reduces a company's tax bill. My guess is still that (a) if Amazon were sold for parts, the bulk of the value of the company would be in software and know-how, and (b) that the resale price of the true PP&E on Amazon's balance sheet *as a going concern* will be well in excess of the value at which it's carried. So while the value of Amazon isn't its capital equipment, it's definitely true that there's lots of value there in reinvested capital, whether that value is on the balance sheet or not. So how much would you value Amazon's capital equipment at? Can we make a serious dent in the $130 billion market cap? I'm pretty skeptical, especially if much of it is tailored to Amazon-specific needs that aren't shared by smaller online retailers, which is everybody else. The Microsoft example doesn't help here. Microsoft's software had tremendous value because it was the foundation of a tremendously profitable business. If Microsoft was liquidated, whoever got its global software monopoly would get huge money. If Amazon can't make a profit, its software isn't part of a tremendously profitable business, and doesn't get value the same way. Nobody is going to get rich by buying the rights to Amazon's software. (If you could get rich that way, Amazon would have turned into a software company by now instead of doing online retail.) The same goes for all its capital goods.